The Clean Water Act of 1972 established a control program for ensuring that communities have clean water by regulating municipal wastewater dischargers. Calgon Carbon has the products, services and technical expertise to help meet demanding municipal wastewater regulations. Municipal wastewater can carry a variety of pollutants that can adversely affect the ecology of receiving lakes, streams and rivers. Calgon Carbon offers a variety of advanced technologies to prevent the migration of contaminants into protected waters. Powdered and granular activated carbons remove organic chemicals and reduce toxicity in municipal wastewater to allow safe discharge into surface water. It is highly effective for odor removal and for the treatment of soluble organic chemicals, endocrine disruptors and other contaminants of emerging concern. Calgon Carbon can design and engineer ultraviolet (UV) disinfection systems to treat the flow of wastewater streams and combined sewer overflows. 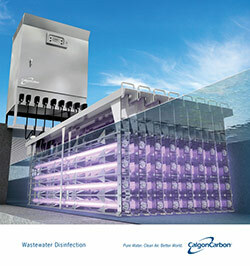 UV technology disinfects wastewater by scrambling the DNA of organic contaminants without creating harmful by-products. Combined with hydrogen peroxide, UV technology also is highly effective for the abatement of nitrosamines, pharmaceutical products, personal care products and endocrine disrupters. Ion exchange technology removes the perchlorate, nitrate and hexavalent chromium from municipal wastewater. Calgon Carbon can provide a wide range of capital and service equipment to address specific municipal needs. Flow rates from less than a few liters per minute to thousands of gallons per minute are effectively and economically treated through Calgon Carbon designed and manufactured equipment.